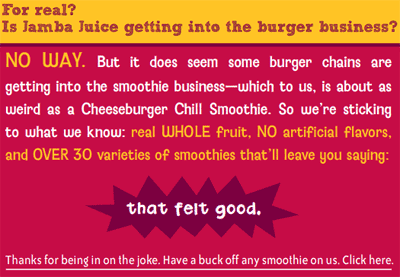 Fast Food News: Jamba Juice Making Cheeseburger Smoothies!?!? Jamba Juice Making Cheeseburger Smoothies!?!? Could it be? Is Jamba Juice really putting burgers and blenders and serving them up with ketchup and mustard!?!? Their point is that fast food chains are getting into the smoothie business, but that's not their specialty (like Jamba) and they're not doing as good a job. The implication is that fast food restaurants serving healthy, tasty smoothies makes as much sense as Jamba Juice putting a hamburger in a blender. Just for receiving their little message, they're offering a coupon for $1 off a smoothie.